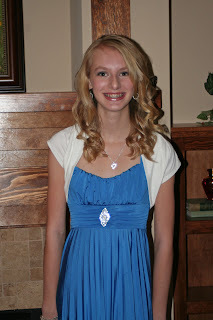 My 15 year old son is going to a dance, my 14 year old son would rather stay home with us... Weird! Maybe I should take a picture of it, chances it won't happen again! I love, Love, LOVE it when you give advice to Samantha on national blogovision. (Nice term, huhh? You only WISH you came up with it first.) I seriously LOVE your skirt. Did you make it??? I still think Strange Brew is hilarious. I love your date's hair! Happy New Year. She looks beautiful! BUT if you could just figure out how to get her hair as puffy as your hair was, she's be really, um, something! Wow! What a beauty! I still remember my first New Year's Eve Dance - I was five and that sneaky Brandon Ryan snuck a kiss before I punched him in the gut. Needless to say, it wasn't a very successful night for me. Are you wearing a lighter color blue cumberbund? A scarf would have made the look complete. That gorgeous, smart daughter of yours did top the dance! Which is infinitely better than table top dancing at the dance. I'm just sayin'. I wasn't at the party, but I bet you're right. She's beautiful! You both wore blue, but Sam's will not look stupid 20 years from now, not like yours does. Holy cow, she's lovely. Weird, since she's...what? Seven? Yeah. Seven. White and blue... it's a family affair! So we crashed Gem's dance, posing as chaperons. They don't really dance at all anymore. What they do is stand in the dance floor talking in groups. When the chorus comes on everyone puts their hands in the air and bounces up and down. It is totally bizarre!!! 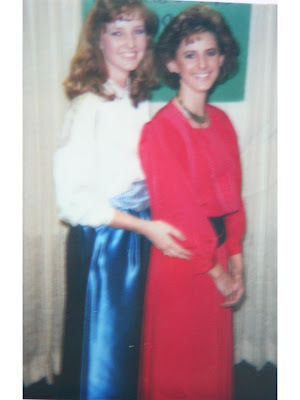 I just love that you and Samantha are wearing basically THE SAME DRESS 25 years apart. Blue skirt, blue cumberbund thingy, and a white shirt or jacket. When Samantha's daughter goes to her first New Years Eve Dance, she has to do it too now.